I’ve been on holiday for a week, this has meant a lot of reading! 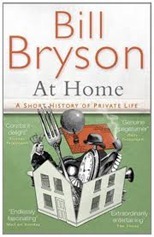 Next up is “At Home: A Short History of Private Life” by Bill Bryson. A thick book arranged thematically around the rooms in Bryson’s house, a rectory in Norfolk. The links between the various rooms and the topics discussed are sometimes tenuous, such as the one between the cellar and the Erie Canal. As I have commented before my book “reviews” are as much about noting things that I learnt from a book as they are “reviews” but in this case I struggle since there are simply so many facts to absorb. Since Bryson lives in a rectory “men of the cloth” feature; here I learnt the distinction between vicars and rectors: vicars received the little tithes of the parish, and rectors the great tithes. This meant for many years that they had quite considerable incomes for not necessarily a great deal of work. Some made great use of their copious spare time for strenuous intellectual activity, as a measure of this Bryson suggests searching for vicars and rectors in the Dictionary of National Biography – there’s an awful lot of them, more even than politicians. The era of wealthy reverends finally ended with the collapse of agricultural incomes in the 1870s. Agricultural incomes collapsed in part through the arrival of long distance imports from North America and New Zealand. These were facilitated in part by steam ships but also by the introduction of refrigerated transport arising from the Wenham Lake Ice Company, started in 1844. Prior to this transport within the US had been improved by the building of the Erie Canal linking New York City to the Great Lakes. The Erie Canal was built between 1817 and 1825, and was the making of New York City since it provided a link through the Appalachian Mountains from the populous East to the breadbasket of the mid-West. At the time it was a substantial achievement – it was to be the biggest canal in the world at a time when the US did not have a single native born canal engineer. The link with cellars is that what goes on in the cellar holds the whole house up (well, not quite, but it’s a literary device) and that materials are important in enabling development: building the Erie Canal was facilitated by the invention of a new hydraulic cement. Whilst agricultural incomes were collapsing in the UK, the US was experiencing its Gilded Age during which industrial output surged and some people become tremendously wealthy (such as J.P. Morgan, John D. Rockefeller, Andrew Carnegie, Cornelius Vanderbilt amongst many others). They spent this money on houses, amusing themselves and philanthropy – very little seems to have gone in tax – Bryson states there was no permanent income tax in the US until 1914. I was surprised by the late arrival on the scene of professional architects. The book talks in some detail about John Vanburgh (1664-1726) who designed Castle Howard and Blenheim Palace, however it was not until the end of the 19th century that compulsory examinations were required of architects in Britain and a full-time academic courses were established. 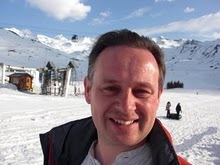 Vanburgh was brought up in my home town – Chester. I was also interested to read of John Lubbock who grew up in the same village as Charles Darwin. As a keen entomologist he discovered in 1886 the pauropoda – a family of mites, but not only this: in later life he was to introduce both the Bank Holidays Act and the Ancient Monuments Act. He was also first president of the Institute of Bankers and married the daughter of Augustus Pitt-Rivers, one of the founding fathers of archaeology. He founded the Electoral Reform Society – it difficult to read his biography and not be astounded by the sheer range of his achievements. 1851 pops up regularly – this is the year of the Great Exhibition in London. Joseph Paxton designed the Crystal Palace in which it was housed, taking advantage of standardised components (the iron glazing bars) and newer, cheaper materials (plate glass) to build a quite remarkable building. The speed with which he achieved this is incredible: design to completion in under 16 months. George Peabody stepped in to fund the American contribution at the last minute, an area which displayed many ingenious machines for manufacturing. Many Londoners learnt the wonder of the flushing toilet; this would lead to a flood of toilets being installed across the city, overwhelming the sewerage system which would be then be rebuilt by Joseph Bazalgette. The book ends with the decline of the British country house during the first part of the 20th century following the introduction of death duties by William Harcourt. In the 1780s, just to show that creative ridiculousness really knew no bounds, it became briefly fashionable to wear fake eyebrows made of mouse skin.